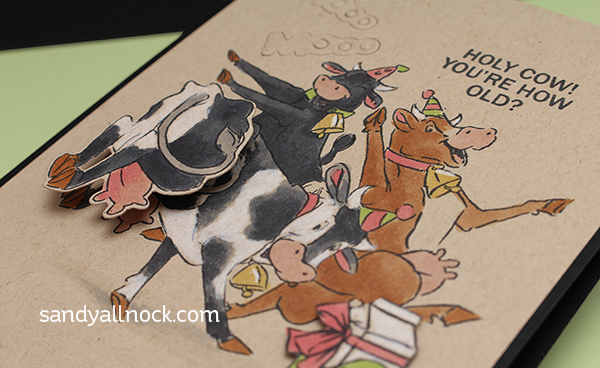 Mini Action Wobble Card – with cows! Hey there – I have a fun card video posted over HERE today – check it out but first …. Leave a comment by December 19th with a cow pun here on my blog to qualify to win a $50 gift certificate from Ellen Hutson! Extra cow puns in your sentence win you more chances. Because, cows. I was udderly delighted to see this card and video! Hay! It’s true ‘cows I have this stamp and needed the tips you provided. I’ll mooove along and give someone else a chance. 🙂 p.x. my dad is a real-live small farm dairy farmer…can’t wait to make one for him!